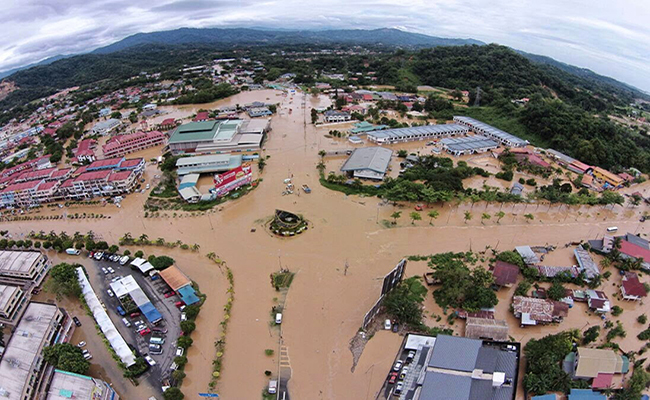 As floods recede in parts of peninsular Malaysia, residents of northern Sabah find themselves facing yet more flooding. Sabah now finds itself among the top five hit regions with over 1000 evacuees seeking shelter in flood relief centers. Pahang suffered the most damage during the course of this flood season with over 41,000 evacuees in total, Kelantan with over 9000, Perak with above of 6000 flood victims. Earlier this week, the Daily Express reported how villages in Sabah have been hit by sudden flash floods due to heavy rainfall. Amongst the worst hit locations in Sabah are Kudat with 909 displaced victims, Kota Belud with 821, Pitas with 139 and Kota Marudu with 82, as of 4 January. As water levels are not expected to recede quickly, victims are asked to stay put and wait till conditions become better. Past years have seen Sabah affected by floods mostly caused by heavy rainfall and this year-end flooding continues the pattern. As a result of this, leaving and entering villages becomes yet another hurdle due to broken bridges, as seen in Kampung Korina, Sabah. According to The Malaysian Insider, Deputy Defense Minister Datuk Abdul Rahim Bakri, MP of Kudat, advised village chiefs to be prepared at all times to face the possibility of floods and to contact relevant parties when the need arises. To date, it is thought that over 200,000 people have been displaced by the floods nationwide.